A tiger from Madras. I scarcely know how to say more precisely. A tiger trips with velvet paws and attacks violently. And his flair ... is just fantastic! He makes misses as almost everybody, but this is the point. His hand saves him, it's a magical one, as if from Indian tales. It makes a move and doesn't miscalculate. Else this hand can make a draw in slightly worse position. Easily and without hesitation. It should be said that our hero "employs" his hand not always. Only when he feels that the time has come. Here an example would be come in handy, but no - magic mustn't be replicated. Mystery should be watched, certainly, Internet helps, but it's better to watch from a hall - as in theater you become a participator of an action. There appears a wish to clean one's eyes, there is an optical illusion - it's impossible to play so quickly in serious games! Errors? Certainly, they happen. But there is not an accountant on the scene, but a player in the highest sense of the word. His playing is ease and supple and if there are chess-players s - the minion of gods, then he is one of them In ancient Vedas there is a story how the world, which is being created by labour, is destroyed in a dance. The greatest god of the Hindu pantheon, many-faced and many-armed Shiva, appears at the critical moment and begins the last dance. One motion followed the other one and the world is destroyed by this light and menacing dance. This picture can't be interpreted in a strict sense. This is an allegorical understanding of how our concept of outworld changes. Shiva or the one, who is protected by him, is necessary for us to see a new spiral turn, when new ideas appear in the place of the old ones. There are few people, who are able to dance destroying dances, but our hero is one of them. We can dissolve any chess-player's style into elements. Anybody has weak and strong sides. Knowledge of such features can help to prepare to an opponent. However, such an analysis is rarely objective. Something very important and inexpressible in terms of logical-anatomical analysis escapes. It could be read in Anand?s characteristic, that he guesses opponents? moves. Well, he guesses and? It's clear, that he saves a lot of time and energy because he doesn?t spend it for calculation of other continuations. One more consequence is that he is lazy at calculation of long variants. And how one cannot be lazy if he has such an intuition? And this laziness appears only when he meets people from the top five. We can draw many conclusions and of cause, we would know something about chess-player Anand. But it would be merely small insignificant details that can help perhaps only those who are going to play with him. It is by far more important to describe the main features of our hero?s character, because it is they that let him be the super Grand Master Anand rather than a common chess-player from the top hundred. Intuition! This point has already been discussed numerous times, however it is too important, to avoid lingering on it once again. We know famous intuitive players - Capablanka, Smyslov, Tal, Petrosian, Karpov are the champions, who shone with their intuitive decisions. And if we expand the list by adding of the greatest chess-players of the last century, which yet could not become the best ones? There are a lot of them? Every of them had his own style and his own type of positions, where their intuition is most pronounced. Tal and Karpov are two poles of this intuition field. Tal?s position type didn?t cross that of Karpov. Smyslov had his own position too. Let?s remember his famous utterance ?if there were rook on the fifth rank? as a demonstration of his approach. However, when it concerned a direct attack on his king, his ability to make intuitive moves failed - because these were other positions. The same is true for the majority even of the most famous players - they clearly divide position on ?theirs? and ?alien?. If a position is ?yours? you have almost no need to calculate, a proper move comes itself. In ?alien? position they have to rely on the other qualities. By the way, great players have no problems with those other qualities either. And what for Anand? Where are his positions? Let's try to remember of the most famous games. We'll at once hit upon an idea that there are a lot of famous games. And they differ in pattern of struggle. Brilliant attacks with intuitive sacrifices? A collection of games can be issued only on this subject. Defence of hard position? Any amount and to any taste. Here is a temporizing in strategically disadvantageous positions, playing move to move, when there is a direct attack on his king, and ability to sacrifice a material in disadvantageous situation, changing a character of a struggle. A reach opening repertory and almost complete range of modern positional methods can also be recalled. And blows, blows - an opponent loses concentration - "small combination" - a game is over. Looking over this wide panorama one understands that there is an all-around chess-players before you. It's evident that among modern super GMs everybody falls into this rather fuzzy category. Nowadays it's necessary to be able to play all kinds of positions to be in the top. But this ability is achieved by hard working. Very often it's possible to feel perspiration dripping from the forehead of Leko, watching his attack, or fantastic concentration from moves of Kasparov. Switching of a stile isn't easy for Kramnik. However these are the strongest players of the world to date. 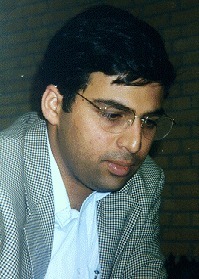 Anand is a born universal chess-players . He calculates worse than Kasparov and puts a game not as deeply as Kramnik does. But his playing is balanced, he can play any position at very high level. His intuition works in his positions. The difference between him and the others is that he has no somebody else's position. In commentary Anand sometimes confesses that he didn't see moves or ideas of his opponent. But he has an inborn sense of chess logic, which doesn't fail even in the most intricate situations. This sense saves him from glaring mistakes and allows an objective estimating of a position. People with great powers of intuition often have flexible thinking. That is ability to adapt quickly to any situation and to change their aims according to concrete circumstances. Kramnik noted that Karpov could instantly switch over and begin to play a position for win the moment it from being the worse one becomes slightly better. This is a very rare trait. Professionals know how difficult is to change that "inertia" of the worse position. Thinking is in fetters of defence dominant and doesn't wish to switch over. Flexibility of thinking of Petrosian made itself evident in another way. He, just the opposite, if was planning to make a draw, then he did it, sometimes not exploiting favourable moments for paying for a win. But it wasn't problem for him to move, for instance, with a bishop from e2 on d3, and at the next move to return. And to go on playing as if nothing had happened. As an antipode Geller can be recalled, who lost his best traits, if he sensed that "logic of the struggle" is violated. Certainly his opponents were trying to make use of these weak points. Anand doesn't have the iron grip of Karpov and his technique isn't as high as that of the 12th world champion. However he also can adapt himself to a situation. He has a worse position and it's necessary to make a draw? He will reflect on it and go about this thankless work. And if he should for that to jump with a knight from c1 on e2 and back, then there is no doubt - he won't hesitate and will jump. Typical of him is also a delicate attack redirection and "computer" indifference to unbeautiful moves - a rook to a7, with a pawn on, and at the next move a bishop to b7 - it's no problem. So, the hero has a flexible thinking and great powers of intuition. But it is not sufficient to play at a level of the top three. One more "main trait" is tactical vision. There is such a notion as "bare tactician". So the chess-players s called, who understand a position quite badly and ground their playing only on traps and blows. Such people usually have a penetrating mind and don't play chess systematically. Most often they are amateurs or gamblers, that is people who play for a stake. It's not very hard to play with them, but you have to be attentive constantly - they can strike an ingenious blow. Playing with Anand, one should always remember of tactics. He won't strike a blow only in one case - if his position is quite winning, he plays with his hand and can miss the opportunity. Several times I heard the GMs comparing his playing to that of computer, just for this ability to find tactical blows instantly. Let's refer to the word "instantly". Speed is the last of outstanding chess traits of Anand. It pins together the previous ones and spiritualizes his playing, makes it more magical and slightly theatrical. Sometimes this momentary grasp of the essence of a position impedes him to make the next step, but most often the next this second step is no longer necessary. Why he didn't become a champion still? The matter concerns not a win in FIDE world championship, but the real championship, the decided superiority. It's told that his character impeded him. As though he plays badly after losses, loses decisive games. Well, I'd argue about his character. He is an inborn player. He knows very well where it's possible to run risks and where it is not. He trusts himself, doesn't fear to sacrifice in the most decisive games. Certainly, he is not a kind of iron champions, in each phrase of whom a confidence in their superiority shines through. But Tal, Smyslov, Spassky became champions. Anand has ill luck, that there is Kasparov and there is no system. In1995 he played in the world championship match. He was selected, apropos, without problems - his superiority over Kamsky in playing was evident. With Kasparov he was fighting head-to-head till the tenth game, but turned out to be not ready for hard counter blows of the 13th world champion. Who knows what the next match between them would be? Maybe Anand would take account of the mistakes of 1995. But already ten years passed by and we are hardly will see a new match between these outstanding GMs. Quite different people play chess and every find his place at the chessboard. There are own artists, sportsmen, revolutionaries, scientists among chess players. The game develops thanks to their efforts. When moments of external deadlock happen, it seems that there is nowhere to go - only emptiness is before. But a person always can be found, who is not like everybody. And gray places become of bright colours with his appearance and everybody wonders: is it really possible? And the new facet makes neighboring facets to sparkle with other tints. And everything that seems to be unshakable becomes shaky and insecure. And many people again begin to work hard - to specify estimations, to reconsider the whole class of positions. And when everything becomes clear, another person appears and the story repeats again and again. There were many heroes in the eventful chess history of 20th century. First, there were giants, then artists, eccentrics, theorists, philosophers. At the end of this golden age stunning Kasparov appeared, the forerunner of chess of a new dimension - the computer dimension. And then thousands of games with a new, impossible in that, previous epoch, tension of struggle. And it seemed that in that glowing furnace it's possible no longer to create, but it's possible only to struggle and try to survive. New generation appeared. They don't trust on books and almost never turn off computers. Ϯ? �ﮪ�,  �䮢尿?ଠ蠯蠭堢?ྲ ꮬ＾򥰮 In some years their time will come, but I think, that the outstanding Indian GM not soon will give ground. The dance will go on.